If you already know me, you probably know I am a vegetarian and that I always have been. I don’t eat fish and I am a very picky eater. Since I don’t eat meat I have to get my protein from another source. Though Mexican food is my favorite (specifically bean cheese and rice burritos), that is something that I can’t eat every day. Well I could because its delicious but I need some variety in my food. So get my daily protein I try to do a protein shake in the morning. I found that this is the easiest and most simple way that I can get that protein, plus they taste pretty darn good. 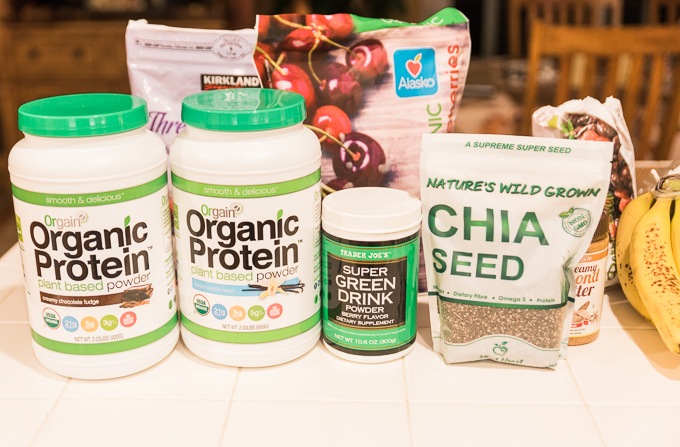 A lot of people ask what I put in my shakes so I wanted to create a post on what I include and how to make it fairly easy. · Or Orgain Organic Plant Based Protein Powder, Creamy Chocolate Fudge. · Organic Almond Butter or Coconut Oil (1 tbp) – When you are adding protein powder to your smoothies, you have to have a natural fat in it as well for your body to process the protein. · Spinach – It’s healthy and you can’t taste it. · Chia Seeds – These little things are good for you too without a taste. · Banana blueberry: One large banana with one cup of blueberries with vanilla protein powder. I use a magic bullet so that way there is no mess to clean up after blending the smoothie, you just take the cup and you’re on your way. Another component that I do to make it easy is to PREP! I go to the store and a ton of bananas – about 30 (it looks like I own a monkey with all these), a frozen three pound bag of organic cherries, one of mixed berries and one bag of blueberries from Costco. 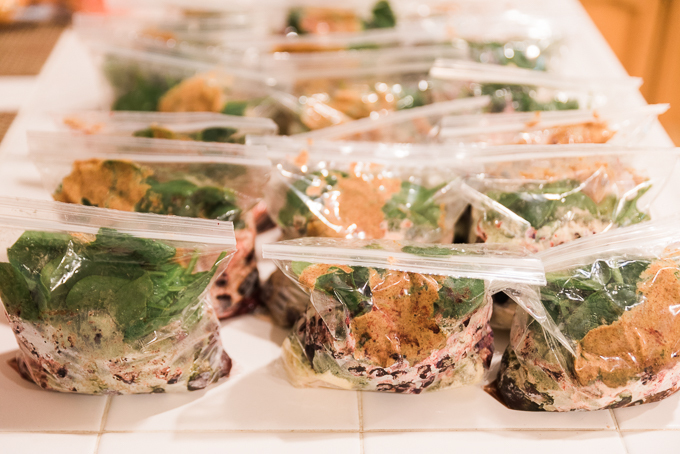 Next I get everything out and open about thirty-sandwich size zip lock baggies. I start with the fruit in each bag then put the rest of the stuff on top because it will stick to the fruit making it easier to come out. After filling all the bags, I put them all in the freezer and they are ready to go. So in the mornings I grab a bag out of the freezer, pour it into my cup (sometimes you have to thaw it out a little) and fill the cup up with almond or coconut water, blend and GO!